NASA’s James Webb Space Telescope (JWST), the next-generation space telescope often touted as Hubble’s successor, is taking shape inside the cleanroom at NASA’s Goddard Space Flight Center in Greenbelt, Maryland. Recently, Goddard’s engineers successfully completed two deployments for the telescope’s side portions of the backplane structure that fold up, called “wings”. 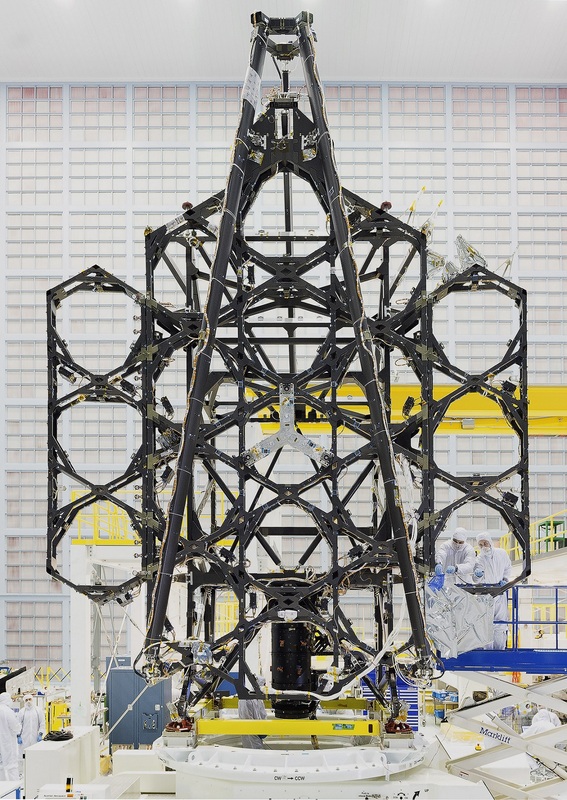 They will also start installing all of the JWST’s primary flight mirrors onto the structure. “We deploy the wings one at a time. Each individual deployment can take up to 16 hours or more to complete. It is a delicate operation requiring multiple groups to perform specific tasks,” said Adam Carpenter, Mechanical Integration Engineer at Goddard. The wings, made by Orbital ATK, consist of 900 separate parts of lightweight graphite that fold up allowing all 18 mirrors to fit inside a rocket which will send the telescope into space. The JWST is being designed to fold like origami to fit inside the Ariane 5 launch vehicle as it will be bigger than any rocket that could launch it. “The two wings of the telescope structure will eventually hold 6 of Webb’s 18 primary mirror segment assemblies. They are necessary so that the observatory can fold up in order to fit into the launch vehicle,” Carpenter said. Before testing the wings, the telescope structure was lined with cables. These cables will enable the JWST to open up in space and will provide electrical signals to the active mirror segments. Thus, the engineers needed to check if there is a risk that the cables would block the deployment in space. The engineers also lifted the telescope’s structure and lowered it by crane onto the bright yellow optical assembly stand. They will soon begin placement of all primary flight mirrors onto the structure. Weighing approximately 46 lbs. (20 kg) and stretching 4.3 feet (1.32 meters) in diameter each, the mirrors will allow the telescope to measure the light from distant galaxies, up to 13.5 billion light-years away from Earth. The mirrors will create the 21 feet (6.5 meters) wide primary mirror. To fit inside the rocket, the primary mirror must be folded in sections for launch, then unfolded precisely when in space. The JWST will be delivered to the second Earth-Sun Lagrange point (L2), located 930,000 miles (1.5 million kilometers) from our planet, on the opposite side of the Earth with respect to the Sun. During the telescope’s trip to L2, different elements will be deployed and commissioning will start. The deployment of the spacecraft’s solar arrays and the high-gain antenna will come first. Then, the sunshield will be unfolded, which will be followed by the extension of the JWST’s tower. Next, the deployment of the secondary mirror will occur, which is positioned on a tripod structure. Lastly, the primary mirror wings will be deployed. The JWST will study every phase in the history of our universe, ranging from the first luminous glows after the Big Bang, to the formation of solar systems capable of supporting life on planets like Earth, to the evolution of our Solar System. It will also allow observations with a unique combination of spectral, spatial, and temporal resolution for the study of outer planet satellites within the Solar System. “JWST has the potential to make really important observations about the temperature of the lavas which has many implications for processes on the surface and within the interior of Io [Jupiter’s moon]. My personal goal is to figure out how big the magma ocean inside Io is,” Laszlo Kestay, director of the U.S. Geological Survey’s Astrogeology Science Center told SpaceFlight Insider. The JWST is an international collaboration between NASA, ESA (the European Space Agency), and the Canadian Space Agency (CSA). NASA’s Goddard is managing the development effort. The main industrial partner is Northrop Grumman; the Space Telescope Science Institute will operate JWST after launch.